Photographer: Tim Walker. Model(s): Irina Liss & Yoon Young Bae, Tami Williams. Source: i-D Magazine. 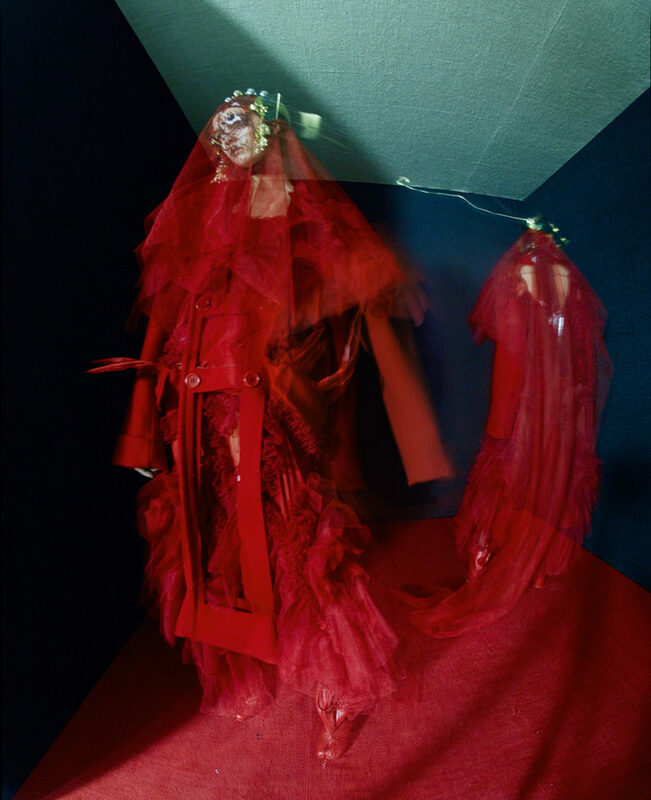 Stylist: Grace Coddington, Maison Margiela (by John Galliano), Set Design; Shona Heath. Makeup: Pat McGrath. Hair: Eugene Souleiman. Tami Williams, Irina Liss & Yoon Young Bae converge in couture for a “A Meeting of Minds” by Tim Walker for i-D Magazine, Spring/Summer 2017. Searching in kind we dare to find the abstract forces of the inner mind. To first imagine the sounds of silence. A thoughtful place of overflowing grace where we fully flourish. That is a compelling concept. In the fluid findings of the forceful world we are left to enjoy this bounty of recovery. Seeking full freedom, we long to escape those ties that bind. To witness a moment of truth, creative influences converge. Gorgeous ghost like apparitions move through an abstract gate, appearing in an unearthly state. See-thru yet solid, this unique combination echos the art of the times. Sanity sits in silence reverberating off the walls of wonder. Allow yourself to be swept away by the unconventional beauty of John Galliano, for Maison Margiela 2017 Artisanal Collection. The incomparable, Grace Coddington, goes to the heights of fashion to make a statement of strength. Holey connected yet uniquely complete, each picture is a part of this ever-evolving piece of poetry. Poised to project passion fashion and the face fuse. Sartorial access is made through avant-garde excess, as this exposes the art of enticement. Sheer tulle works in conjunction with silk, giving each ensemble a unique sense of balance. The woman in white effortlessly appears over the crisp coat, with armhole cutouts and a tall hat to match. Her face floats on top of the fabric with ethereal appeal, somehow familiar yet utterly unknown. A dream within a dream… the boxes they inhabit seem to turn about ~ from right-side up to upside down. 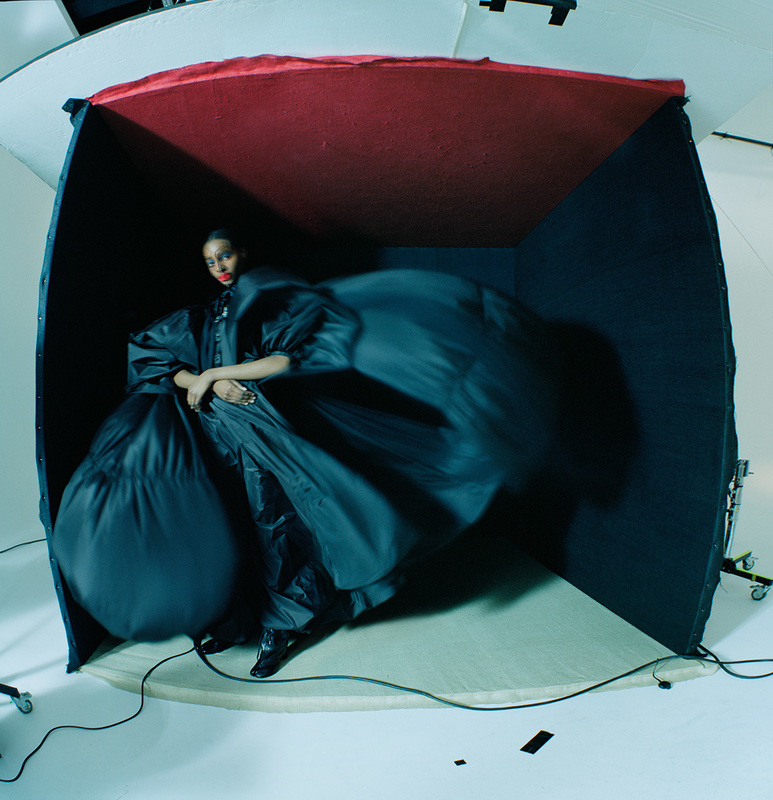 Abstract images are created inside, as Coddington showcases a series of compelling couture. Crimson covers Irina in a coat-dress topped with a scarlet string hanging over the head. While, a short skirt/shirt are torn up and tied together, with a pair of booties made with the famous Galliano Toe Separation. Embracing a sense of twisted enchantment this editorial explores the art of asymmetry. 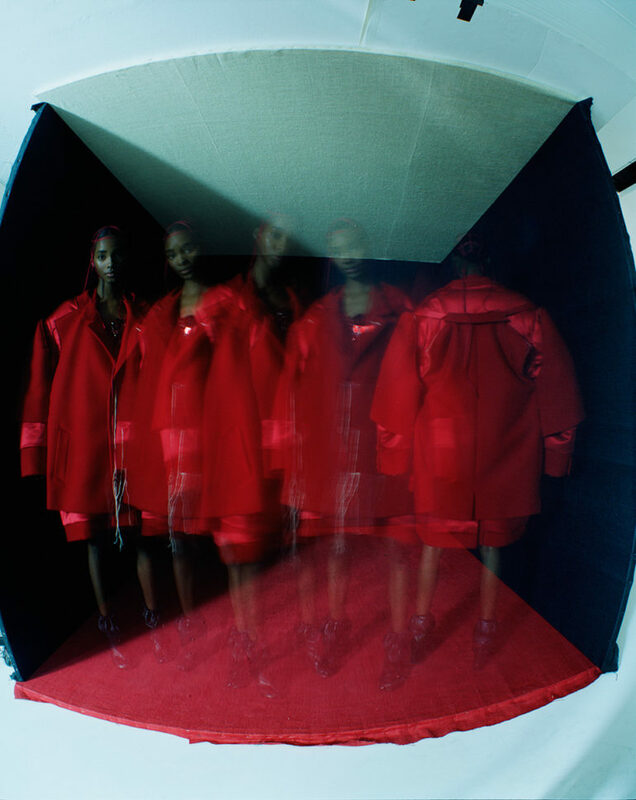 Tami revels in red fabric, exposing a series of strategic cut-outs. Layers of sheer silk pile up, covered by a wool coat done in the same color concept. Exposed panels show whats below, as the long, red overcoat is worn over the top. Liss’s image stands side by side, wearing sheer tulle with black bands covering her private parts. Yoon Young Bae dons a design that mimics her face, openly embodying the intention of this piece. Powerful in her presentation she stands in harmony with the presence. A veiled overlay falls over the face appearing to mimic the abstract makeup. Seductive yet sad, this image captures the creative intention Maison Margiela. Pat McGrath is a tour de force of the face, with makeup that mimics the sartorial scene. Giving features a real intention, each picture appears like paint on a palate. McGrath’s Makeup isn’t afraid to pull you into an unknown place. Daring to employ a touch of the treacherous. Through her tantalizing applications we are able to truly explore. Shadow brings forth a sharp color tone found in deep blue, while on the runway the bold lips were brilliantly achieved with strips of red string. Topping things off… black lines are drawn over the left eye, down the nose and then under the right eye. Leaving behind a stripe of tears falling down the cheek, and a black line that flies over the brow. Eugene Souleiman honors the head by allowing each ensemble to make a statement coiffure. The image appears in all white, toppling overhead like a lighthouse at sea. Standing tall brings high-hat drama, while a light cloche adorns a layered silk gown and red feathers explode off a retro inspired Garbo Hat. The art of asymmetry is explored, as this is a small example of the genius exposed at this year’s runway. Cutting through layers of symbolism, Maison Margiela manages to make this season a sojourn of spontaneity. I remember reading Sarah Mower’s write-up on the collection and being utterly transfixed. “It literally meant looking deeply into garments, often stripping them away to their seams until they became cage-like soft sculptures, to reveal the under-workings spilling out.” This description brings to mind the idea of a couture connection. To me that always lends to the idea of something beyond what we can see. In Mower’s piece, Galliano states that his goal is, “to reduce it down to the memory of emotion.” Here he is speaking about a conceptual connection. True Couture Has that Capability… to touch it’s viewers through tactile expression and mention intention. A tribute to the soul. Sanity sits in silence allowing the artful echos to reverberate off the wind.